Pale yellow to the eye, Gaspereau Vineyard’s Riesling exemplifies class from its first impression. Enjoy the combination of Meyer lemon zest and golden delicious apples on both the nose and the palate, and allow the delicate nature of this wine to showcase it’s sophisticated profile. Riesling is a grape varietal that can showcase an immensely broad range in levels of sweetness, age, and weight, making it difficult for a consumer to predict the characteristics of any given bottle, especially with the complex German (the most famous Riesling region) labeling system. Thankfully, Gaspereau Vineyards is producing a German style wine that will give you the experience of top notch Riesling without the confusion. As with all Rieslings, this wine is quite high in acid—which makes it a great match for food—with a great counterbalance due to the slight sweetness present. A refined wine such as this calls for a food pairing of equal complexity and quality. Fortunately, Frédéric Tandy, owner of Ratinaud French Cuisine, can offer exactly what is needed. Although this wine can accompany most cured meats and cheeses successfully, I encourage you to visit this local shop and try a few homemade items that will make this wine truly shine. 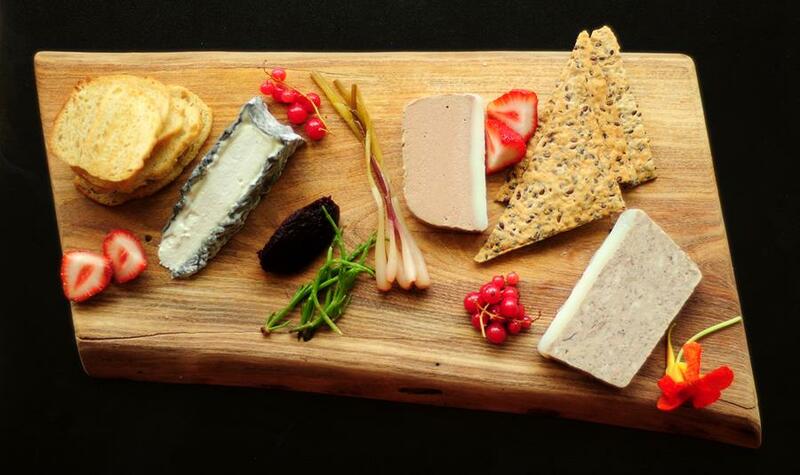 Indulge in my top picks—creamy grey owl goat cheese, a robust duck rillette, or an extraordinary foie gras mousse. Eat like the French, drink like the Germans, and live like the Canadians…how fortunate! Cheers!